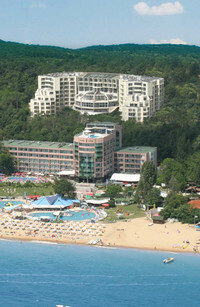 The four- stars parkhotel “Golden Beach” is situated in Golden Sands, surrounded by beautiful and quiet park area, only 200 m from 5 km long beach, covered with fine golden sand and 19 km from the Blacksea capital city Varna. Parkhotel “Golden Beach” offers 247 rooms with balkonies and seaview. All rooms are equiped with cable TV, minibar, safety deposit box, direct dial telephone, bath, WC, hairdryer. For your convenience the hotel has a main restaurant, lobby bar, pool bar, conference hall, indoor, outdoor swimming pool, outdoor children's playground, babysitting, kids club, balneology, mini golf and volleyball playground.